It feels like such a long time since I posted a NOTD or even wore nail polish. It's probably been about a month since I've worn it and my nails are in a much better condition because of it. I have missed painting my nails though so the first polish I wore after my break was this one. 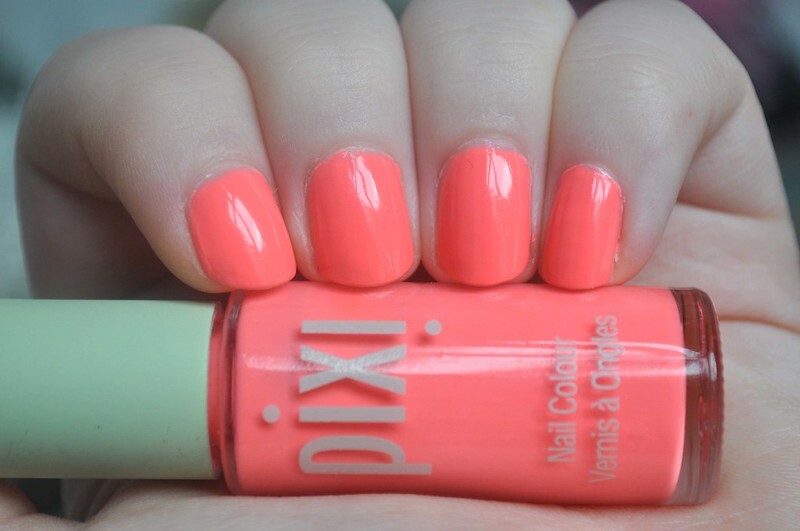 Coral Cabana from Pixi is a neon coral that is so hard to capture the true colour in a photograph. This is as close as I can get but it's so much brighter, more orange and less pink. From looking at other images on google it seems people are having the same problem and no one, at least that I've seen, has captured its true colour. For some reason before this summer I always hated neons and thought they wouldn't suit my pale skin. Turns out they look fine, or at least I think they do, and I've got a nice little collection of them now. A couple are actually in my August favourites a long with this one. This, along with Summer Pink, is my first Pixi polish and definitely not my last. In fact I've ordered a couple more from the ASOS sale as I couldn't resist the £4.50 price tag plus the extra 10% off using "extra10". I can safely say my only buying 10 polishes this year has completely gone out the window! I love the packaging with the metal green lid, it might even be one of my favourites. The brush is quite thin which I like as I have very small nails. It hasn't got the best consistency which is it's only let down. In the photo above I have two coats on but I feel like it could have done with a third to even it out properly. Have you tried Pixi polishes? What a lovely pop of colour. Its really pretty. I love Pixi products they are always great qulaity. That color is so pretty! It looks great on you!